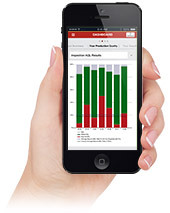 QIMA Mobile App: Now Manage Your Supply Chain on the Go! Hong Kong, September 27, 2013 - QIMA, a leading provider of quality control services helping brands, retailers and importers secure their global supply chain today announces the launch of its mobile application which will allow inspections, audits and lab tests to be conveniently ordered from mobile devices. "International buyers are by their very essence mobile. Empowering them to access supplier KPI's, book inspections, tests and supplier audits and approve reports on the go, will increase their efficiency and control over their import operations." said Sebastien Breteau, CEO, QIMA. The QIMA App is free and can be downloaded for iOS, Android or accessed on the web at www.qima.com/mobile. Product inspections are $ USD in China, India, Bangladesh, Vietnam, Thailand, Africa and Latin America; $ USD in Europe and anywhere else in Asia. Factory, social and environmental audits are $ USD. QIMA is a leading quality control service provider, helping international brands, retailers and importers secure their global supply chain. With unique web-based quality control management tools for companies seeking Product Inspection, Factory Audit and Laboratory Testing services, QIMA serves clients from over 110 countries.